Creating green environments—especially in urban areas—is on the rise. From the installation of a new solar panel project every two minutes to the emphasis on reducing carbon emissions, people are focused on reducing energy consumption and helping the environment for a greener tomorrow. Cities today are faced with the challenge of meeting the needs of urban dwellers as well as trying to foster an eco-friendly future. One way to help the environment is right beneath our feet. Permeable pavers and permeable paver grit help reduce stormwater runoff as well as replenish groundwater. The permeability of these pavers and corresponding crushed aggregate between pavers means that stormwater—which can collect and carry harmful pollutants with it—can seep through the surface of the ground and be naturally filtered as it passes. The encouraged absorption of this rainwater also means that nearby rivers and lakes are less likely to be subject to pollutants and flooding. Nearly 2.7 million people are living in the urban jungle dubbed Chicago. With that many people creating carbon footprints and siphoning energy, any push toward a greener tomorrow is a good one. Check out some of Chicago’s greenest grounds: Buckingham Fountain Plaza, Loyola University and the Metropolitan Correctional Center. The pavers making the expansive plaza surrounding Chicago’s infamous Buckingham Fountain uses Kafka Granite’s aggregate between pavers. Our Sunset Pink permeable paver grit perfectly complements the aesthetic of this historic fountain and landmark while providing the green solution fit for Chicago’s eco-conscious efforts. 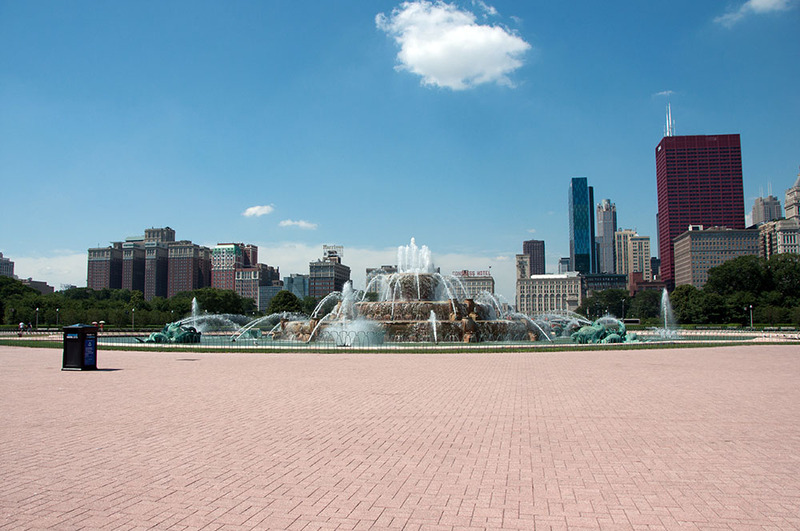 Permeable paving in Chicago is most effective in areas closer to Lake Michigan because they’re underlain with sandy permeable soils—which makes Buckingham Fountain the perfect place for a permeable paver grit solution. Kafka’s expansive color variety enabled the paver grit to be a beautiful compliment to the unique Unilock pavers in this setting, as well as be the most functional solution for a permeable plaza. 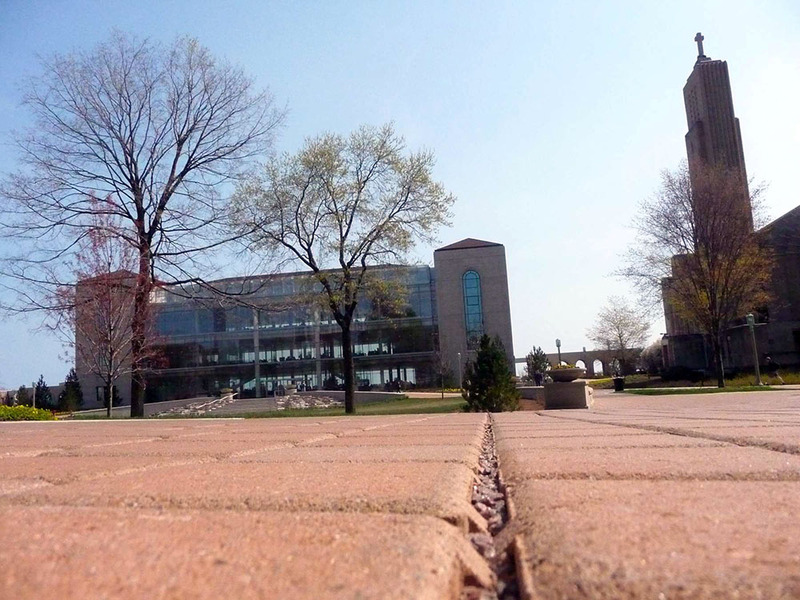 Loyola University of Chicago is home to more than 16,000 students. When it came to grounds solutions, permeable paver grit was the go-to for this project. Used as fill between Permeable Interlocking Concrete Pavement, Kafka’s Mauve permeable paver grit (PPG) provides ample stormwater drainage. Our quality materials also easily stand up to high volumes of foot traffic and the grueling freeze/thaw cycles of a Midwestern winter. With Kafka’s aggregate as Loyola’s permeable grit, they won’t have to worry about the grit breaking down or clogging their runoff system. The Metropolitan Correctional Center was opened in 1975 and stands as a looming 28-story federal prison in the thick of Chicago’s downtown. While this may seem unusual, the prison as a whole fits into the architectural backdrop of the city. With a sleek combination of modern and urban design, complementing the design was important when it came to the surrounding plaza. The MCC’s unique landscape design called on using both Kafka’s Platinum Granite PPG and Wausau Tile’s permeable pavers. What’s more, our standard platinum granite pathway material was used throughout the patio area in order to allow for maximum drainage around the trees. Our state-of-the-art crushing facility can create permeable paver grit to match your exact sizing needs or standards. Plus our impressive variety of color options, nearly 60 colors in all, means you can find the paver grit to perfectly complement your paving project. The importance of a high-quality PPG that is properly sized for your project cannot be stressed enough. Opting for softer materials, such as marbles and limestones, leaves you at risk for clogged joints as those materials will break down with time. Similarly, a grit that is too small defeats the purpose of a permeable design as it will compact too densely and not allow for optimum drainage. If you’re paying a premium for permeable pavers, make sure to get the most out of them with the right PPG. The importance of permeability in ground-cover solutions is especially important when protecting nature from harmful pollutants, which keeps our cities like Chicago beautiful places to live and visit. Plus, permeable solutions can earn you points toward LEED certification for your project. 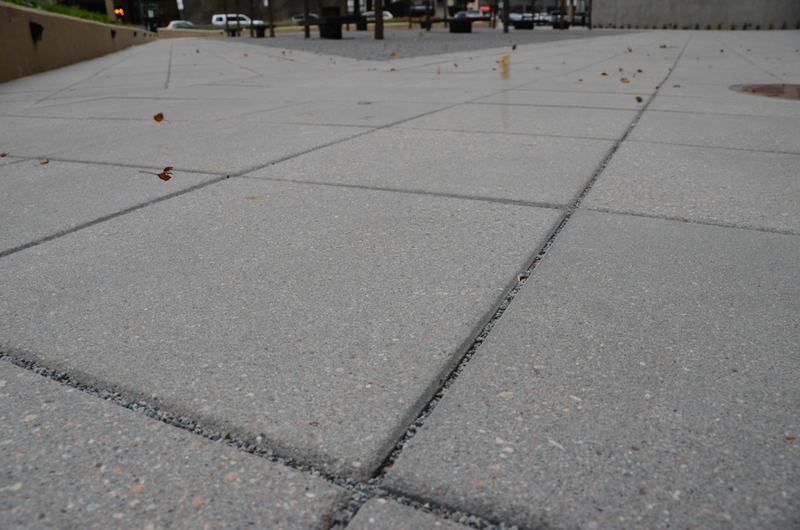 To hear more about the benefits of Kafka’s permeable paver grit, contact us today. Our experts can answer any question you may have and can help with your project.